Tuesday (we discovered that schools get free entry on Tuesday which could only mean more crowds). From Subway 天安门东站 Tiananmen East Station Exit B, walk straight (away from the 天安门 Tiananmen security check) then turn left into 南池子大街 South Chizi Street. 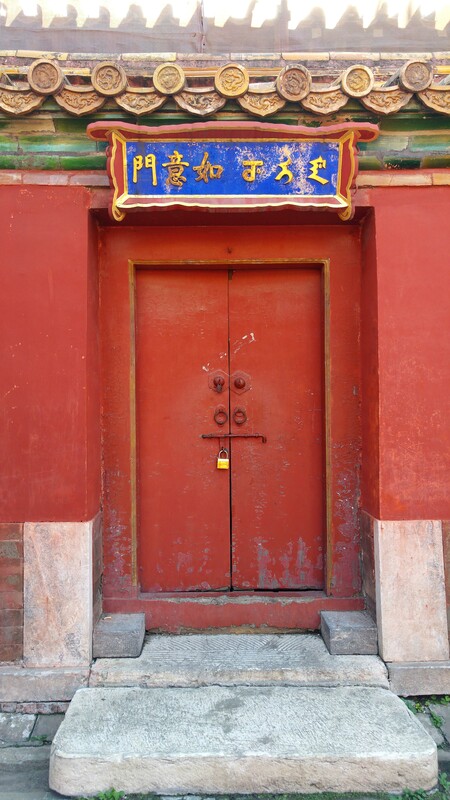 Continue walking straight till you see 北京市劳动人民文化宫/太庙 Beijing Working People’s Cultural Palace. Pay ¥2 entrance fee and go through the very quiet security check. Follow the signs to 故宫博物院 The Palace Museum (basically walk straight then turn right). You know you have reached when you see the huge crowds. That is the entrance at 午门 Meridian Gate (the header image above), but you have to walk some more to buy the tickets at one of the 20 counters. Get ready ¥60 each and your passport. They will need to key in your identification for foreigners. For Chinese nationals, they only have to scan their ID, so the queues actually moved quite quickly. The counters open at 8.30am sharp. Once you get your tickets, you can then go get the audio guide (¥20 for Mandarin, Cantonese, Hokkien, ¥40 for foreign languages), and you are ready to go! 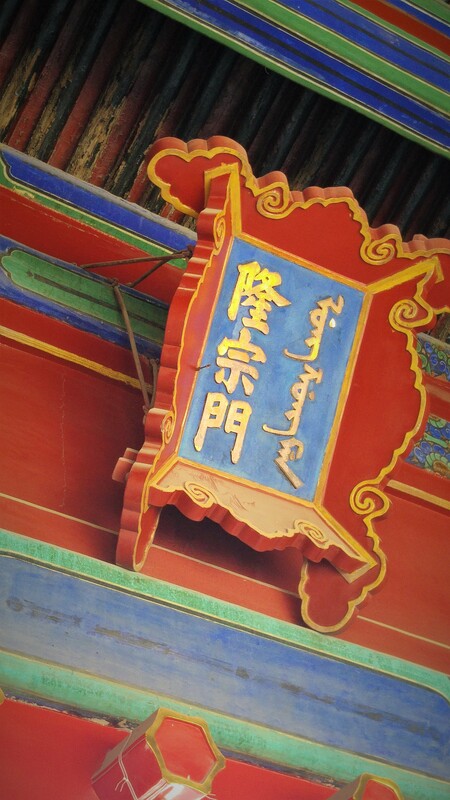 There are two aspects that you can explore 故宫博物院 The Palace Museum. One is the architectural aspect (and the history surrounding them) or the Palace aspect and the other is the exhibits aspect or the Museum aspect. The audio guide proved to be a very useful gadget to aid in the understanding of the vast grounds. It is equipped with a sensor that will automatically start speaking with a very clear voice when you are near a building or an exhibit. It will also highlight the tidbits associated with the building whenever there are which made the tour more interesting. 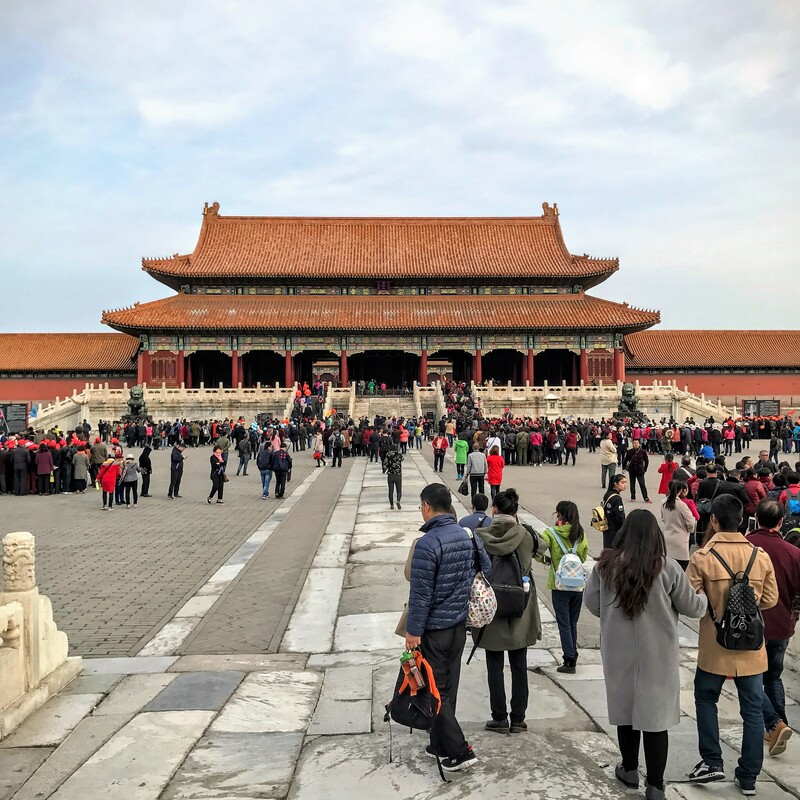 The central axis after 午门 Meridian Gate is the logical direction to follow (because the exit is right at the other end of the palace) but it’s horribly crowded! We were here from 8.30am to 2.30pm and the crowd never seemed to stop. This included busloads of tourists (both from China itself and foreigners) with their very loud tour guides with flags, students on school visits, individual free-and-easy tourists, and lots of freelance tour guides who kept touting for business around these innocents. We walked the right axis (you could try the left side too because they were symmetrical) immediately after the main gate, and had a much quieter visit. 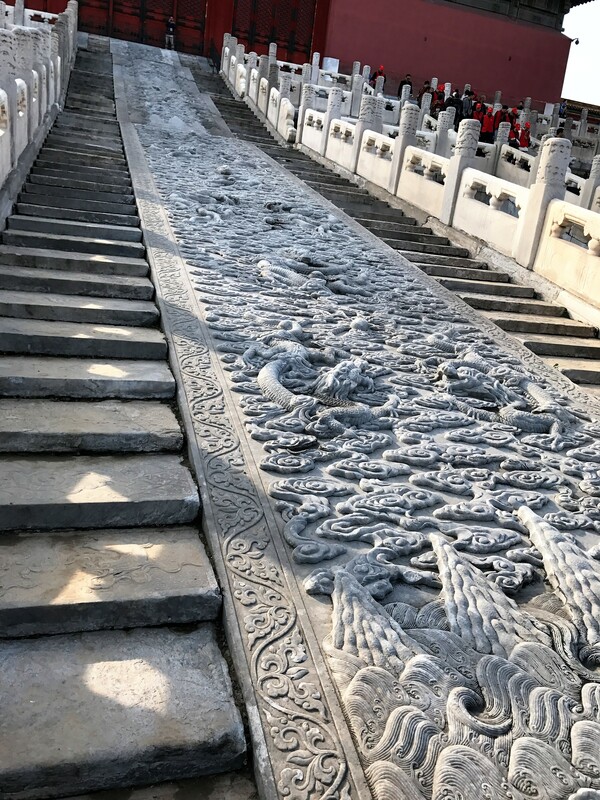 After the 午门 Meridian Gate along the central axis would be the 太和门 Gate of Supreme Harmony followed by 太和殿 Hall of Supreme Harmony, 中和殿 Hall of Central Harmony and 保和殿 Hall of Preserving Harmony used for ceremonial purposes and daily state affairs. 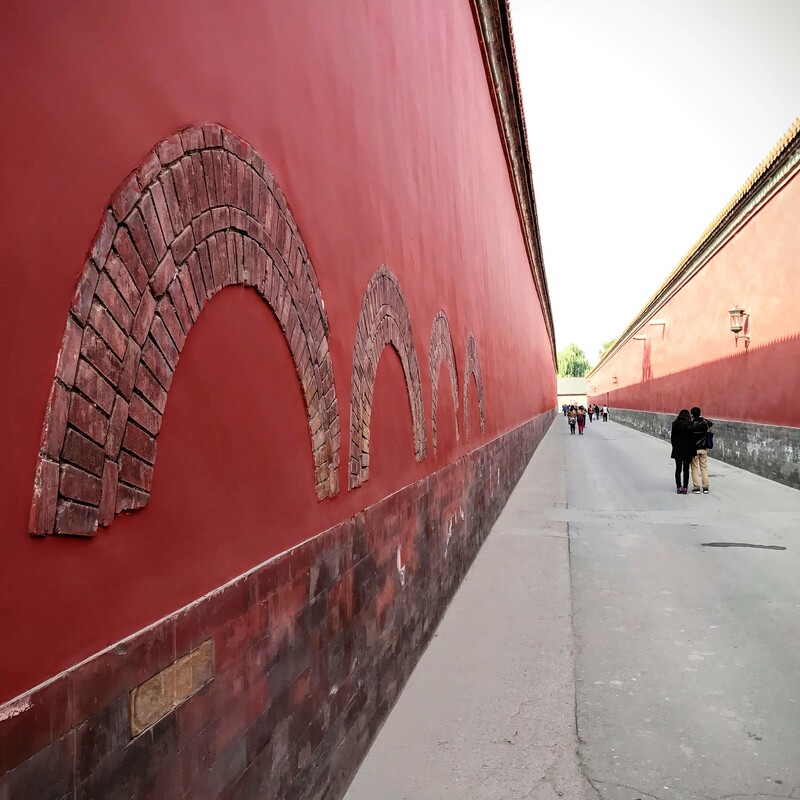 Beyond the 3 halls would be 乾清门 Gate of Heavenly Purity which separated the 外朝 Outer Court or 前朝 Front Court from the 内廷 Inner Court or 后宫 Back Palace. 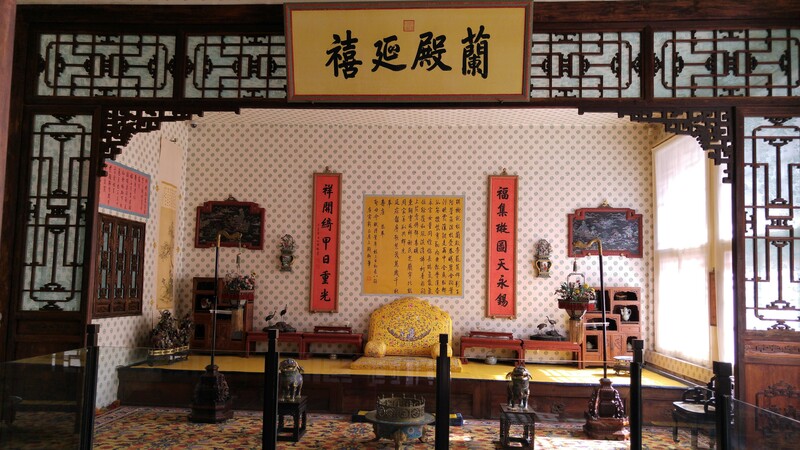 The inner court would be the Emperor’s residence in 乾清宫 Palace of Heavenly Purity and the Empress’s residence in 坤宁宫 Palace of Earthly Tranquility. 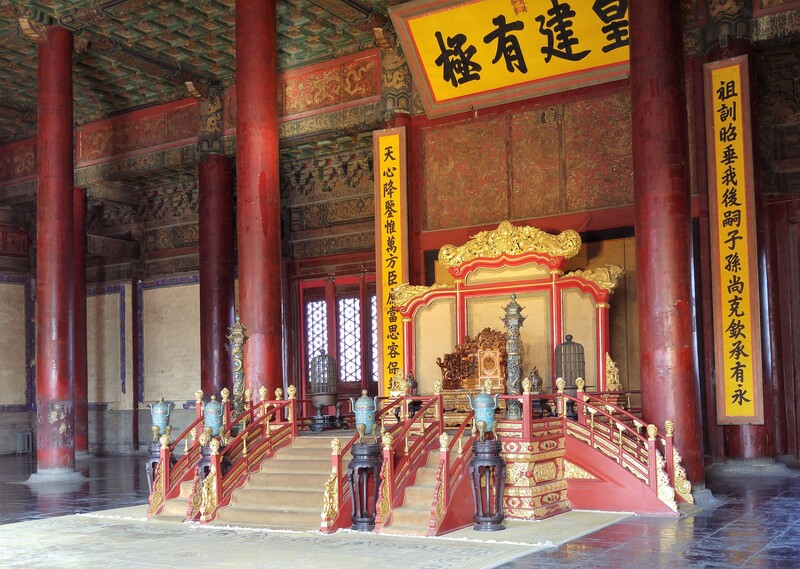 The Emperor’s concubines would occupy 东六宫 Six Eastern Palaces and 西六宫 Six Western Palaces. 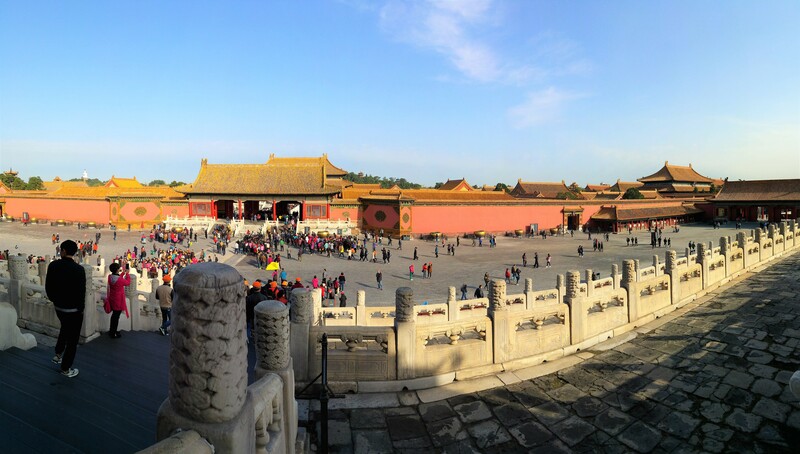 At the northmost of the palace would be the 御花园 Imperial Garden and beyond that the exit to the palace. 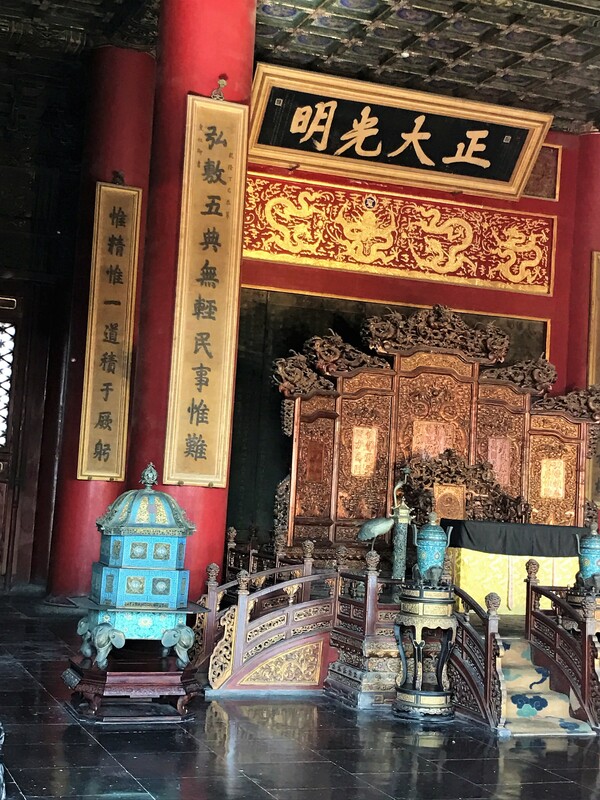 Of course, there were many more gates and palaces in the sprawling ground, like the Emperor’s reading rooms 御书房, Empress Dowager’s residence in 慈宁宫 Palace of Compassion and Tranquillity and many gardens. 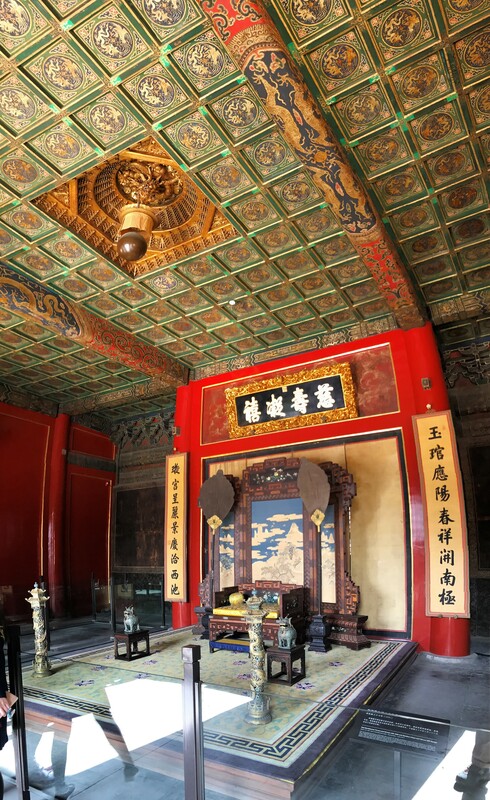 It was said there were as many as ten thousand rooms in the palace when it was first built! Not all the rooms and palaces are opened at any one time; the museum opens around 70% of the grounds and works on renovations and restorations on the rest. 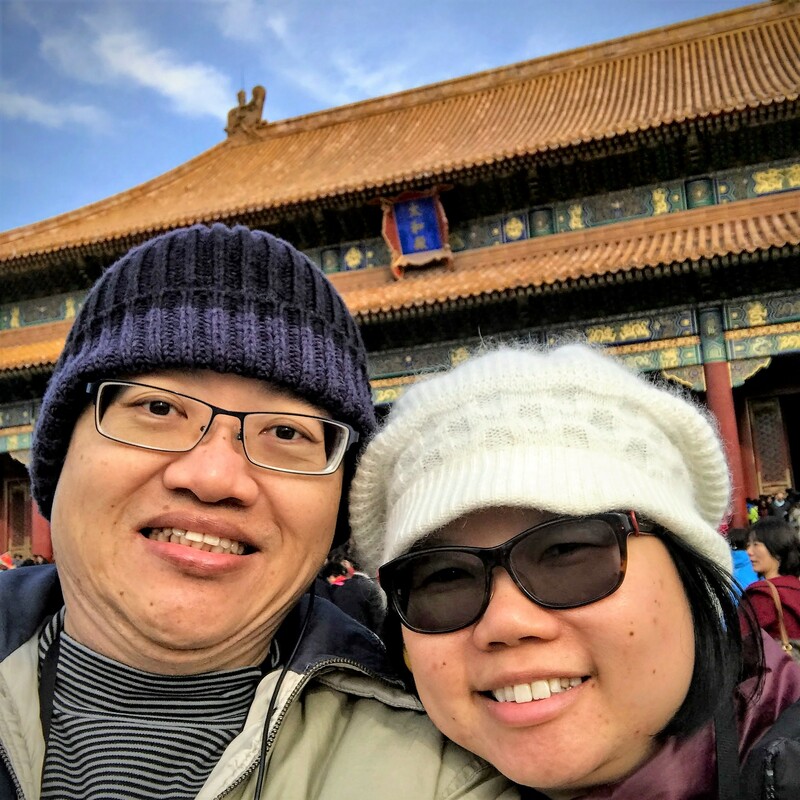 We visited most of the palaces along the central axis, as well as some of the more famous ones and recently-opened ones like 慈宁宫 Palace of Compassion and Tranquillity because there was an exhibition on Empress Dowager. 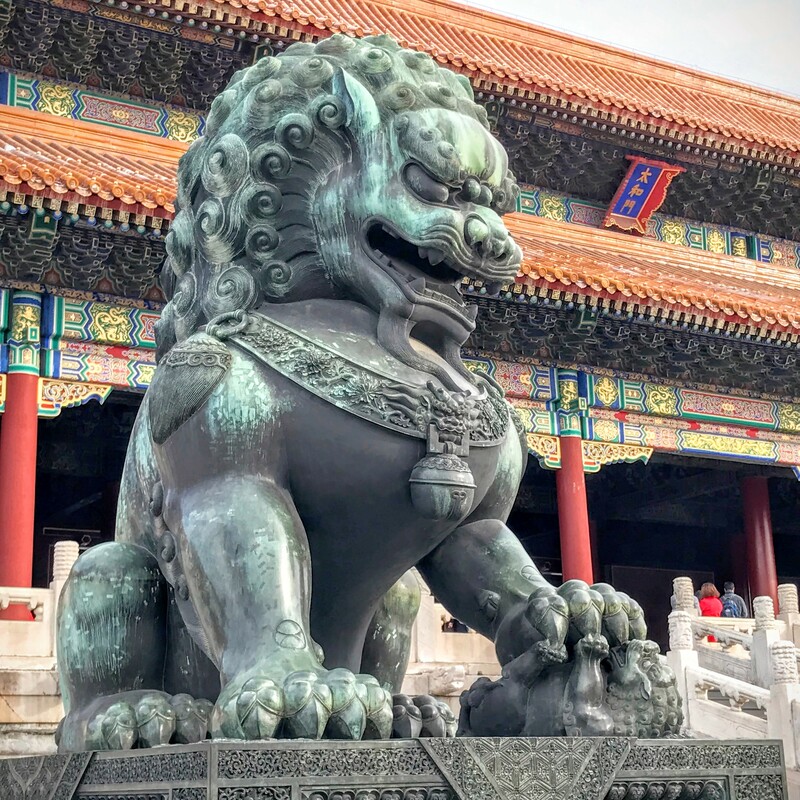 It was a fun day to immerse oneself in the atmosphere and the history of China, and reliving the all-so-familiar scenes in movies and dramas. But you definitely need a good and comfortable pair of shoes and lots of water and snack because you are going to spend a good amount of time in it! We were here from the moment the museum opened at 8.30am to 2.30pm which was 6 hours and we couldn’t finish all the exhibits! Directions: Take Subway Line 1 to 天安门东站 Tiananmen East Station Exit B.